Sake or saké (pronounced /ˈsɑːkiː/ or /ˈsɑːkeɪ/ in English and [sake] ( listen) in Japanese) is a Japanese alcoholic beverage made from rice. This beverage is called sake in English, but in Japanese, sake (酒) or o-sake (お酒) refers to alcoholic drinks in general. The Japanese term for this specific beverage is Nihonshu (日本酒), meaning "Japanese sake". Sake is also referred to in English as rice wine. However, unlike true wine, in which alcohol is produced by fermenting the sugar naturally present in fruit, sake is made through a brewing process more like that of beer. To make beer or sake, the sugar needed to produce alcohol must first be converted from starch. But the brewing process for sake differs from beer brewing as well, notably in that for beer, the conversion of starch to sugar and sugar to alcohol occurs in two discrete steps, but with sake they occur simultaneously. Additionally, alcohol content also differs between sake, wine, and beer. Wine generally contains 9–16% alcohol and most beer is 3–8%, whereas undiluted sake is 18–20% alcohol, although this is often lowered to around 15% by diluting the sake with water prior to bottling. The origins of sake are unclear; however, the earliest written reference to use of alcohol in Japan is recorded in the Book of Wei, of the Records of Three Kingdoms. This 3rd century Chinese text speaks of the Japanese drinking and dancing. Sake is also mentioned several times in the Kojiki, Japan's first written history, compiled in 712. People used sake for spiritual functions because people who had it got a fever. The first alcoholic drink in Japan may have been kuchikami no sake ("mouth-chewed sake"), which is made by chewing nuts or grains and spitting them into a pot. The enzymes from the saliva allow the starches to saccharify (convert to sugar), and then ferment. This method was also used by Native Americans (see cauim, chicha and pulque), and inscriptions from the 14th century BC mention Chinese millet wine (小米酒,xiǎo mǐ jǐu) being made the same way. Though there are various opinions in the start of sake, ancient sake was a basically sticky state of the paste as "neri sake" that remained in Izumo and Hakata now. Regardless, by the Asuka period, true sake - made from rice, water, and kōji mold (麹, Aspergillus oryzae) - was the dominant alcohol. In the Heian period, sake began to be used for religious ceremony and people seldom drank it. Sake production was a government monopoly for a long time, but in the 10th century, temples and shrines began to brew sake, and they became the main centers of production for the next 500 years. The Tamon-in Diary, written by abbots of Tamon-in temple from 1478 to 1618, records many details of brewing in the temple. The diary shows that pasteurization and the process of adding ingredients to the main fermentation mash in three stages were established practices by this time. In the 16th century, technique of distillation was introduced into the Kyushu district from Ryukyu, and started brewing shochu called "Imo - sake," sold at the central market in Kyoto. And, powerful daimyos imported various liquors and wine from Europe, China, and Korea. This is the title page of the earliest explanation of the process of brewing sake to be published in the West. 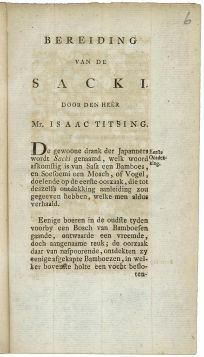 In 1781, Isaac Titsingh published Bereiding van Sacki in Batavia, which was then the main city of the Dutch East Indies. Most of the breweries that grew and survived this period were set up by wealthy landowners. Landowners who grew rice crops would have rice left over at the end of the season and, rather than letting this stash of rice go to waste, would ship it to their breweries. The most successful of these family breweries still operate today. During the 20th century, sake-brewing technology grew by leaps and bounds. The government opened the sake-brewing research institute in 1904 and, in 1907 the very first government-run sake tasting/competition was held. Yeast strains specifically selected for their brewing properties were isolated and enamel-coated steel tanks arrived. The government started hailing the use of enamel tanks as easy to clean, lasting forever, and being devoid of bacterial problems. (The government considered wooden barrels to be unhygienic because of the potential bacteria living in the wood.) Although these things are true, the government also wanted more tax money from breweries, as using wooden barrels means that a significant amount of sake is lost to evaporation (somewhere around 3%), which could have otherwise been taxed. This was the end of the wooden-barrel age of sake and the use of wooden barrels in brewing was completely eliminated. During the Russo-Japanese War in 1904–1905, the government banned the home brewing of sake. At the time, sake made up an astonishing 30% of Japan's tax revenue. Since home-brewed sake is tax-free sake, the logic was that by banning the home brewing of sake, sales would go up, and more tax money would be collected. This was the end of home-brewed sake, and the law remains in effect today even though sake sales now make up only 2% of government income. When World War II brought rice shortages, the sake-brewing industry was dealt a hefty blow as the government clamped down on the use of rice for brewing. As early as the late 17th century, it had been discovered that small amounts of alcohol could be added to sake before pressing to extract aromas and flavors from the rice solids, but during the war, pure alcohol and glucose were added to small quantities of rice mash, increasing the yield by as much as four times. 75% of today's sake is made using this technique, left over from the war years. There were even a few breweries producing "sake" that contained no rice at all. Naturally, the quality of sake during this time suffered greatly. After the war, breweries slowly began to recover, and the quality of sake gradually went up. However, new players on the scene — beer, wine, and spirits — became very popular in Japan, and in the 1960s beer consumption surpassed sake for the first time. Sake consumption continued to go down while, in contrast, the quality of sake steadily improved. Recent increases in the popularity of shōchū also bode ill for the future of sake in its native country. While the rest of the world may be drinking more sake and the quality of sake has been increasing, sake production in Japan has been declining since the mid 1970s. The number of sake breweries is also declining. While there were 3,229 breweries nationwide in fiscal 1975, the number had fallen to 1,845 in 2007. And now, 1 October is provided the day of sake (Nihon-shu). Some of the steamed rice is taken to a culture room and inoculated with kōji mold (麹, Aspergillus oryzae). The mold-laden rice is itself known as kōji and is cultivated until the growth of the fungus reaches the desired level. This takes about two days. When the kōji is ready, the next step is to create the starter mash, known as shubo (酒母), or colloquially, moto (酛). Kōji rice, water, and yeast are mixed together, and in the modern method, lactic acid is added to inhibit unwanted bacteria (in slower traditional methods, lactic acid occurs naturally). Next, freshly steamed rice is added and the yeast is cultivated over 10 to 15 days (in the modern method). When the starter mash is ready, steamed rice, water, and more kōji are added once a day for three days, doubling the volume of the mash each time. Staggering things this way allows the yeast to keep up with the increased volume. The mixture is now known as the main mash, or moromi (醪, also written 諸味). Unlike malt for beer, rice for sake does not have the necessary amylase to convert starch to sugar and so must undergo a process of multiple fermentation, in which starch is converted to sugar by the kōji, and sugar is converted to alcohol by yeast. With sake these two processes happen at the same time, not as separate steps, so sake is said to be made by multiple parallel fermentation. After fermentation, sake is pressed to separate the liquid from the solids. With some sake, a small amount of distilled alcohol, called brewer’s alcohol (醸造アルコール), is added before pressing in order to extract flavors and aromas that would otherwise stay in the solids. With cheap sake, a large amount of brewer’s alcohol might be added to increase the volume of sake produced. Next, the remaining lees (a fine sediment) are removed, and the sake is carbon filtered and pasteurized. The sake is allowed to rest and mature and then it is usually diluted with water to lower the alcohol content from around 20% to 15% or so, before finally being bottled. Various types of sake offered for sale at a Japanese grocery in the United States. There are two basic types of sake: futsū-shu (普通酒) and tokutei meishō-shu (特定名称酒). Futsū-shu, "ordinary sake," is the equivalent of table wine and accounts for the majority of sake produced. Tokutei meishō-shu, "special designation sake," refers to premium sakes distinguished by the degree to which the rice is polished and the added percentage of brewer's alcohol or the absence of such additives. Honjōzō-shu (本醸造酒), in which a slight amount of brewer's alcohol is added to the sake before pressing, in order to extract extra flavors and aromas from the mash. This term was created in the late 1960s to distinguish it, a premium sake, from cheaply made liquors to which large amounts of distilled alcohol were added simply to increase volume. Sake with this designation must be made with no more than 116 liters of pure alcohol added for every 1,000 kilograms of rice. Junmai-shu (純米酒), "pure rice sake," made from only rice, water and kōji, with no brewer's alcohol or other additives. Before 2004, the Japanese government mandated that junmai-shu must be made from rice polished down to 70% or less of its original weight, but that restriction has been removed. Ginjō-shu (吟醸酒), made from rice polished to 60% or less of its original weight. Sake made from rice polished to 50% or lower is called daiginjō-shu (大吟醸酒). The term junmai can be added to ginjō or daiginjō, resulting in junmai ginjō and junmai daiginjō. However, as distilled alcohol is added in small amounts to ginjō and daiginjō to heighten the aroma, not to increase volume, a junmai daiginjō is not necessarily a better product than a daiginjō made with brewer's alcohol. In addition to "ordinary" sake and the special designations, there are many more types of sake. Kimoto (生酛) is the traditionally orthodox method for preparing the starter mash, which includes the laborious process of grinding it into a paste. This method was the standard for 300 years, but it's rare today. Sokujō (速醸), "quick fermentation," is the modern method of preparing the starter mash. Lactic acid, produced naturally in the two slower traditional methods, is added to the starter to inhibit unwanted bacteria. Sokujō sake tends to have a lighter flavor than kimoto or yamahai. Genshu (原酒) is undiluted sake. Most sake is diluted with water after brewing, to lower the alcohol content from 18-20% down to 14-16%, but genshu is not. Muroka (無濾過) means unfiltered. Note that this refers to sake that hasn’t been carbon filtered, but which has been pressed and separated from the lees, and thus is clear, not cloudy. Carbon filtration can remove desirable flavors and odors as well as bad ones, thus muroka sake has stronger flavors than filtered varieties. Nigorizake (濁り酒) is cloudy sake. The sake is passed through a loose mesh to separate it from the mash. It isn't filtered thereafter and there is much rice sediment in the bottle. Before serving, the bottle is shaken to mix the sediment and turn the sake white or cloudy. Seishu (清酒), "clear/clean sake," is the Japanese legal definition of sake and refers to sake in which the solids have been strained out, leaving clear liquid. Thus nigorizake and doburoku (see below) are not seishu and therefore aren't actually sake under Japanese law. However, nigorizake can get seishu status by being strained clear and having lees put back in afterward. Koshu (古酒) is "aged sake." Most sake does not age well, but this specially made type can age for decades, turning yellow and acquiring a honeyed flavor. Taruzake (樽酒) is sake aged in wooden barrels or bottled in wooden casks. The wood used is Cryptomeria (杉, sugi), which is also inaccurately known as Japanese cedar. Sake casks are often broken open ceremonially for the opening of buildings, businesses, parties, etc. Because the wood imparts a strong flavor, premium sake is rarely used for this type. Shiboritate (搾立て), "freshly pressed," refers to sake that has been shipped without the traditional six-month aging/maturation period. The result is usually a more acidic, "greener" sake. Fukurozuri (袋吊り) is a method of separating sake from the lees without external pressure, by hanging the mash in bags and allowing the liquid to drip out under its own weight. Sake produced this way is sometimes called shizukazake (雫酒), meaning "drip sake." Tobingakoi (斗瓶囲い) is when sake is pressed into 18-liter bottles ("tobin") and the brewer selects the best sake of the batch for shipping. Kuroshu (黒酒) is sake made from unpolished rice (i.e. brown rice), more like Chinese rice wine. Teiseihaku-shu (低精白酒) is sake with a deliberately high rice polishing ratio. It is generally held that the lower the rice polishing ratio (the percent weight after polishing), the better the potential of the sake. However, beginning around 2005, teiseihaku-shu has been produced as a specialty sake made with high rice polishing ratios, usually around 80%, to produce sake with the characteristic flavor of rice itself. Specific gravity is measured on a scale weighing the same volume of water at 4°C and sake at 15°C. The sweeter the sake is, the lower the number gets. When the SMV was first used, 0 was designated the point between sweet sake and dry sake. Now +3 is considered neutral. Kasu (粕) are pressed sake lees, the solids left after pressing and filtering. These are used for making tsukemono pickles, livestock feed, and shōchū, and as an ingredient in dishes like kasu soup. In Japan sake is served chilled, at room temperature, or heated, depending on the preference of the drinker, the quality of the sake, and the season. Typically, hot sake is a winter drink, and high-grade sake is not drunk hot, because the flavors and aromas will be lost. This masking of flavor is the reason that low-quality sake is often served hot. Sake is usually drunk from small cups called choko and poured into the choko from ceramic flasks called tokkuri. Saucer-like cups called sakazuki are also used, most commonly at weddings and other ceremonial occasions. Recently, footed glasses made specifically for premium sake have also come into use. Another traditional cup is the masu, a box usually made of hinoki or sugi, which was originally used for measuring rice. In some Japanese restaurants, as a show of generosity, the server may put a glass inside the masu or put the masu on a saucer and pour until sake overflows and fills both containers. Aside from being served straight, sake can be used as a mixer for cocktails, such as tamagozake, saketinis, nogasake, or the sake bomb. In general, it is best to keep sake refrigerated in a cool or dark room, as prolonged exposure to heat or direct light will lead to spoilage. Sake stored at room temperature is best consumed within a few months after purchase. After opening the bottle of sake, it is best consumed within 2 or 3 hours. It is possible to store in the refrigerator, but it is recommended to finish the sake within 2 days. This is because once premium sake is opened, it begins to oxidize which affects the taste. If the sake is kept in the refrigerator for more than 3 days, it will lose its "best" flavor. However, this does not mean it should be disposed of if not consumed. Generally, sake can keep very well and still taste just fine after weeks in the fridge. How long a sake will remain drinkable depends on the actual product itself, and whether it is sealed with a wine vacuum top. Sake is often consumed as part of Shinto purification rituals (compare with the use of grape wine in the Christian Eucharist). Those sakes, served to Gods as offering prior to drinking, are called Omiki or Miki (お神酒又は神酒). During World War II, kamikaze pilots drank sake prior to carrying out their missions. On the New Year many Japanese people drink a special sake called toso. Toso is a sort of iwai-zake made by soaking tososan, a Chinese powdered medicine, overnight in sake. Even children sip a portion. In some regions, the first sipping of toso is taken in order of age from younger to older. ^ Kaempfer, Engelbert. (1906). The History of Japan, Vol. I. p. 187. ^ Morewood, Samuel. (1824). An Essay on the Inventions and Customs of Both Ancients and Moderns in the Use of Inebriating Liquors, p. 136. ^ Gauntner, John. (2002. The Sake Handbook, p. 78. ^ Omura, Mika (November 6, 2009). "Weekend: Sake breweries go with the flow to survive". http://www.asahi.com/english/Herald-asahi/TKY200911060122.html. Retrieved December 29, 2009. ^ "The People". eSake. http://www.esake.com/Knowledge/Ingredients/People/people.html. Gauntner, John. (2002). The Sake Handbook. Tokyo: Tuttle Publishing. 10-ISBN 0-8048-3425-3; 13-ISBN 978-0-8048-3425-4. Look up saké in Wiktionary, the free dictionary.